A card game that features 6 mini-games for 2 to 6 players, 11 years old and up. 6 mini games gives Rites of Cthulhu and variety of game play experiences, with each mini-game seated in the world of H.P. Lovecraft. Deeply seated in H.P. Lovecraft's Cthulhu Mythos, Rites of Cthulhu allows players to become cultists and perform 6 rites based on stories by H.P. Lovecraft. During each rite, players compete for artifacts such as The Necronomicon, Henry Akeley's Brain, The Jade Hound, and other iconic objects from Lovecraft's tales. The player at the end of the game with the most artifacts wins. 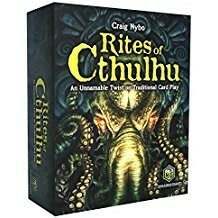 Rites of Cthulhu features 6 mini-games. Play all 6 in one overall game for plenty of play variety or play one of the mini games all night long. The Rites of Cthulhu game features mini card games based on the following Lovecraft stories: The Call of Cthulhu Game At the Mountains of Madness Game The Hound Game Out of the Aeons Game The Tree on the Hill Game The Dunwich Horror Game Long before ancient life, as indicated by human evidence, winked into existence, the Great Old Ones walked our landmasses, lived in our oceans, and hung in our skies. But most of them eventually left Earth and fell into a death-like sleep. These horrors of the universe render us no more significant than the insects that we crush under our boots as a matter of living. Some humans divide themselves into cults and commit their existences to worship of these Great Old Ones. The rites these cultists practice often bring nothing more than ruin and madness. But they can also bring grandeur that surpasses imagination.